IoT is already prevalent in homes... think Alexa, Nest thermostats, Ring video doorbells and WiFi connected light bulbs. A recent Wired magazine article, Industrial IoT: How Connected Things are Changing Manufacturing, referenced a report that 79% of homes have at least one connected device. Where consumers go, businesses follow. The construction industry is at a critical juncture that will require this sooner rather than later. The construction industry must adopt IoT technologies in order to manage future growth. The American Society of Civil Engineers estimates US infrastructure construction needs of $4.6 trillion by 2025 and others estimate worldwide investment needs of $20 trillion in the next 20 years. Yet, in its 2017 report, Reinventing Construction: A Route to Higher Productivity, the McKinsey Global Institute revealed that construction productivity growth has been just 1% per year over the past two decades, much lower than 2.8% growth for the world economy. McKinsey states that this is because the industry is also the "least digitized". Odd, considering that the nature of construction requires such extensive collaboration and review among so many parties. With aging Baby Boomers retiring and fewer younger people entering the industry, it is easy to conclude that construction industry will need to embrace digital technology to manage the imbalance while it tackles the biggest infrastructure build-out in history of the world. 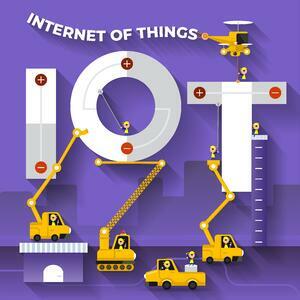 "IoT involves extending Internet connectivity beyond standard devices, such as desktops, laptops, smartphones and tablets, to any range of traditionally dumb or non-internet-enabled physical devices and everyday objects. Embedded with technology, these devices can communicate and interact over the Internet, and they can be remotely monitored and controlled." Sensors placed in construction equipment will monitor performance and analyze operating efficiency. IoT software will be able to predict repair needs before they become issues that cause downtime, The software will automatically send a notice to perform the repair when the equipment is off-line and use the data to predict future needs. Tools will be tagged by geo-locators to reduce waste from time spent looking for them and, worse, theft. RFID tagging already exists as a solution to address this but the tags used are often passive, meaning that they send a signal only when scanned. So, the tool's location is registered as the last place in which the tag was scanned. As geo-location tags evolve and come down in price, tools will be outfitted with them for constant monitoring and reporting back to a web-hosted inventory management system. Infrastructure products will include sensors with IoT reporting capability. While project owners are already requiring passive RFID tagging of concrete, and precast manufacturers find that RFID tagging helps improve their own productivity, this is just the start. Current practices enable parties to the construction process to input information about the product (QC/QC information, production stage, shipment status, etc.). Embedded sensors will allow contractors and project owners to receive information produced by the product (current location in the laydown yard, structural health, etc). The productivity benefits from 'smart products' are so great that we will dedicate our next post specifically to this topic. Today we are at about the same stage in IoT development as social media was in 2004. A time when Facebook had just launched and LinkedIn had been founded two years before. There is much to come in IoT and it will change the face of the entire construction supply chain. Would you like to learn more about what product tracking can do for your plant today? Download the Idencia Concrete Product Tracking deck by clicking below. 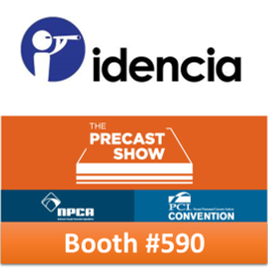 If you are going to The Precast Show, make sure to visit us at Booth #590!